Compare prices and find affordable car hire in Miami. We search among multiple suppliers to find the cheapest prices. Unlimited mileage, the necessary insurance and tax are included in the rate given. 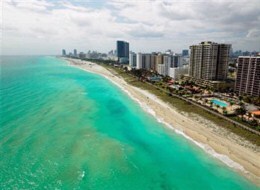 Miami is located along the Atlantic coast of the state of Florida. The city boasts a population of 399,457 inhabitants (2010) and is 143.1 square kilometers in size. Miami is seen as a center for international trade, arts, entertainment, culture, media, commerce, and finance. It is one of the richest cities in the United States and has one of the largest concentrations of international banks. The Port of Miami is commonly referred to as the “Cruise Capital of the World” as many cruise liners dock there before heading out. Many visitors like to take a quick visit to Little Havana in downtown Miami. It has a large Cuban population which boasts many Latin shops and restaurants. Other things to see include the Miami Zoo, Jungle Island, a plethora of beaches (including South Beach and Miami Beach), and Space Miami. There is also the South Beach Food Tour, where individuals learn the history of south beach and savor the local culture through food. Events and festivals held annually in Miami include the Ultra Music Festival, Miami Fashion Week, Carnaval Miami, and the Winter Party. The primary airport that services the city of Miami is the Miami International Airport (MIA). The airport is located 13 kilometers from Miami’s downtown area. It is the largest gateway into the United States from Latin America.